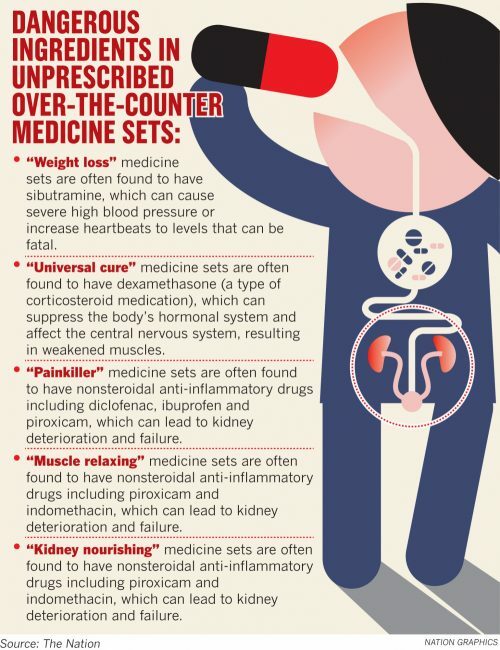 Danger of kidney failure from unprescribed drugs. Buying unprescribed over-the-counter drugs can put you at serious risk of suffering kidney failure. Many pharmacies sell over-the-counter medicine sets involving several different medicines to treat common symptoms over the course of two to three days, which often include unnecessary antibiotics or other substances that can be harmful to the patient. “Whenever I felt muscle strain, I would take this cheap and easy-to-buy medicine, which also later seemed to require a larger dosage, at up to four sets at a time, to get rid of my symptom,” he said. He later developed unusual swelling and was diagnosed as having Phase 3 kidney failure, which required hemodialysis treatment. “I still sought other medicines besides those prescribed by my doctor because I wanted to be cured and I believed in the advertisements. I even bought those Bt12,000 to Bt25,000 medicines for use for three months,” he said. Despite his self-treatment, his kidney condition worsened to become the last phase of chronic renal failure, which doctors blamed on his use of over-the-counter medicine. “I have been suffering to merely survive from the three times a week hemodialysis regime in the past decade,” he said. Thanapol underwent kidney transplant surgery 11 months ago and he now has to take immmuno-suppressant medication for the rest of his life. “Beware of medicine, supplements and herbal products with exaggerated advertising, such as a kidney-detoxing and nourishing supplements that boasts a cure to renal failure patients without the need to get hemodialysis,” he said. “Renal failure patients must take prescribed medicine. 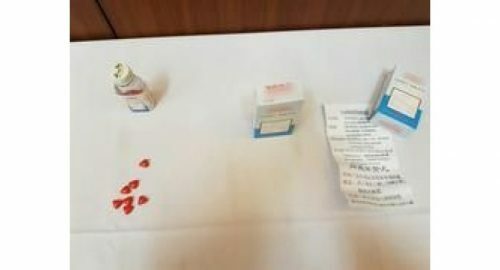 If you take over-the-counter pills due to advertisements and ignore your prescribed treatment, it could worsen your condition and you may die,” he said, adding that companies were making money by selling low-cost products for Bt7,000 to Bt25,000. Another story about a 17-year-old young man was published by Medical Council of Thailand board member Dr Chanwalee Srisukho in October 2015. The teenager’s 45-year-old mother told Chanwalee that she had donated her kidney to the her son who suffered kidney failure after a year of prolonged and frequent use of medicine with non-steroidal anti-inflammatory drugs (NSAIDs). He used the drugs to treat muscle strain but he died a year after surgery from complications. Dr Chairat Chayakul, a kidney disease expert at Mahidol University’s Faculty of Medicine at Siriraj Hospital, said that 8 million Thais had chronic kidney disease and there were about 8,000 new cases every year. Most patients suffering from diabetes or high blood pressure can slow down kidney deterioration by controlling their diet, doing regular exercise and using medicine rationally, he said. However, up to 10 per cent of patients do not follow doctors’ advice. “They believe taking a lot of medicine will affect their kidneys or they simply were bored of taking the prescribed medicines,” he added.